If your goal is escape velocity, you have to build a ship. It’s true that some enterprise-level websites are so fast that they literally push the limits of the laws of physics. But for the rest of us who don’t have an enterprise-level operating budget, there are still plenty of effective and affordable ways to a faster-loading WordPress website. 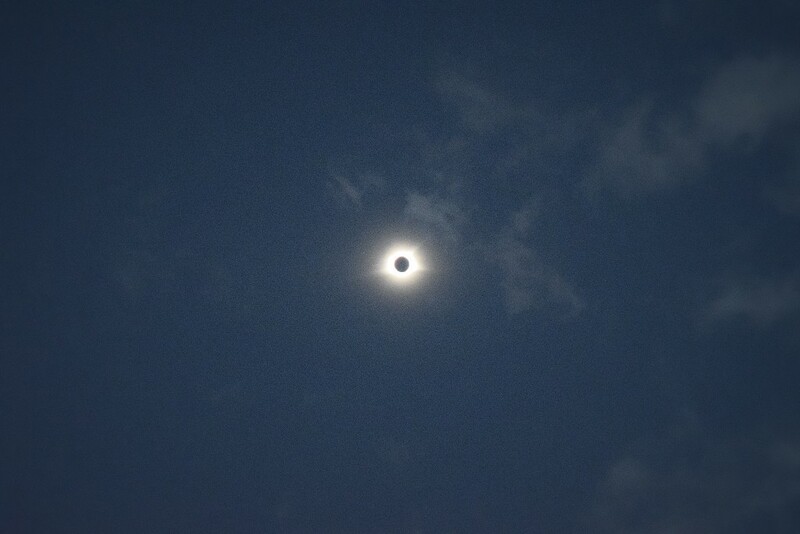 The 2017 solar eclipse, seen from just outside Greenville, SC. In this article, we’ll look at some tools that you and/or your web developer can utilize to speed up your site without breaking the bank. Every time a visitor loads a page on your website, the data gets prepared by a computer (called a server) that is operated by your hosting company. For the purposes of illustration, let’s call this “Mission Control” and let’s suppose that it’s located in Houston, TX. Once the website data is prepared by Mission Control, it then has to take a voyage from Houston to wherever the visitor is physically located (let’s say Asheville, NC). Decreasing the time it takes to complete either of these tasks will be a big win for you and your visitors. However, for almost all sites, the larger factor in page load time (by a wide margin) is the amount of time it takes for the hosting company’s server to generate the data. Because of the above, investing in a solid hosting plan is the number one thing that can improve website speed for the majority of site owners. Build your launchpad by investing in a solid hosting plan. If you have shopped around and compared hosting companies, you may have noticed that some plans can go for as little as five dollars per month, while other plans have heftier prices into the hundreds of dollars per month. You can bet that the cheaper “shared hosting” accounts are all going to be limited in their ability to deliver your site quickly. More than likely, a cheap price means you are renting space on a server that is playing the “Mission Control” role for more sites at once than you’d like to think about. Some hosts that we use frequently at Big Boom Design are SiteGround and WP Engine. There are 1000’s of hosts to choose from, so make sure to let us know if you have questions about your hosting plan or are interested in an upgrade. Another concern with low-cost shared hosting is security. Unfortunately, security issues can sometimes spread across accounts with shared hosting. Since you have no control over which sites you actually share server space with, you have a giant blind spot in the security of your site. While the solution in this case is to invest in better hosting, even sites with premium hosting can benefit from the improved security that SSL certificates offer. Be secure in your orbit — protect your domain with SSL. Using SSL on your site to make it available via the https protocol is a really good idea. In fact, it’s pretty much a no-brainer once you know the benefits it provides. The purpose of an SSL certificate is to encrypt the data being sent to and from your site. What you may not know, though, is that SSL also helps with page load time on your site and even gives your site’s Google ranking a boost. As if the above weren’t reason enough, SSL will likely be a basic requirement in the not-so-distant future. So there really is no reason not to start using SSL on your site today. Like hosting, there are lots of options out there for purchasing SSL certificates. Let us know if you are thinking about securing your site with SSL, and we’ll be glad to give you some options that we use frequently. Watch the payload! Use images wisely. Are you sure you need that eleventh slider image on your home page? While this is (hopefully) an obvious exaggeration, you might be surprised at the effect that images are currently having on your page load time. Images are one of the best ways to make our sites more interesting, eye-catching, and appealing to users. Unfortunately, they are also typically the most time-consuming asset loaded by web pages. Thus, the key is to be conservative with image use and not to overdo it. There are several techniques that can optimize the images used on your site, including compression and proper scaling. Another extremely helpful technique (which is now implemented by WordPress sites) is to deliver responsive images to your visitors. This means that a visitor browsing on a mobile device, for example, will be served smaller images, sized appropriately for their device. As a result, they won’t need to load the larger images that may be in use for visitors browsing on desktops or laptops. Overall, images are just plain slow to load, so we should always think hard about which images need to be used on any given webpage. That said, there is one technique that can (in a way) give us the best of both worlds. When we use a Content Delivery Network, we gain the ability to remove the heavy footprint of images (and other files) from our server altogether and offload the work to a third party. This doesn’t mean that images are no longer a concern, but it does mean that they will load significantly faster. Find out more about optimizing images in WordPress. Extend your galactic empire with a content delivery network (CDN). One of the most effective and most affordable boosts to your website speed is to purchase a Content Delivery Network (CDN) plan. The idea is that instead of relying on a single host location, you are leveraging an existing network that can deliver content from many possible locations across the country or globe. This way, each and every visitor to your site gets the data delivered to them from the closest possible source. Sounds complicated to set up, right? Believe it or not, CDN services are very straightforward to sign up for and start using on your site. A few examples of affordable CDN’s are Amazon Cloudfront, MaxCDN, and Rackspace CDN. Besides the improved performance we get by having multiple server locations, another advantage is that CDN’s are typically much faster than traditional web servers at generating images and other types of files used on your site. In short, CDN’s allow your host’s server to focus on the task of generating your bare bones website framework as fast as possible, while the time-consuming overhead of images and other files is completely offloaded to a third party service. Caching is your slingshot around the sun. Caching is the most difficult concept to understand on our list. On the most basic level, it is a way to help prevent your server from repeating tasks that it has recently done. While caching has intricacies that can vary from site to site, when it comes to WordPress there are a wide variety of plugins that can help. Most likely, using a correctly-configured caching plugin can immediately make your pages load faster. Two effective and totally free caching plugins for WordPress are WP Super Cache and W3 Total Cache. In both cases, you may see unexpected behaviors such as changes on your site not taking effect immediately or caching not working when you are logged in. Most likely, you’ll need to tweak the plugin options to suit your needs. Also, your ability to use caching to its full extent will be affected by the type of hosting account you have. Besides using a caching plugin as a “blanket approach,” there are also ways to customize the caching on your site by working with the WordPress Object Cache. This is an advanced topic outside the scope of this article, but if you have a slow site with a lot of custom data then you could probably benefit from having your developer utilize the WP Object Cache on your site. Hopefully, you now have some insight into what may be slowing down your site, as well as what you or your web developer can do to speed things up. Please get in touch with us if you’d like help reviewing your current page load time and putting together a plan to implement the above tools to speed up your site. You probably won’t end up pushing the limits of the laws of physics, but you can surely speed up your site in an affordable manner by using one or more of these methods. Check out our other posts for more SEO and Analytics tips and tricks. Find out more about author and BBD lead developer Michael Hull and the rest of the team.